Sending Scheduled Email Reports of Klips with variables – How can we help you today? To set up a Scheduled Email Report for a Klip or Dashboard that contains variables, you will need to take an extra step. This is typically because it has a User Input Control component. You will provide the value of the variable you want to display in your Klip. Note: If you do not provide the value of the variable, when you send the email report it will contain a blank Klip or dashboard. Select the Klip that you want to schedule as an email report. Select the Gear Icon at the top right corner of the Klip. In the dialog box, click set up or manage an existing recurring scheduled email. Click Set up an Email Report. At Parameters, click Variable(s). You are asked for the Current Value for each of your variables. Follow the steps below to find your Current Value(s). In a new tab of your web browser open your Klipfolio account. Navigate to the Klip with User Input Controls that you want to schedule as an email report. Click the Gear Icon at the top right corner of the Klip. In the Klip Editor, navigate to the Component Tree on the left-hand side of your screen. In the Component Tree, under Drop-Down List, select Values. On the Data Panel, click the Evaluate Button to see the Current Values for each row in your drop-down list. From Evaluation Results list, highlight a value and copy it. Navigate to your first Klipfolio tab. Under Current Value, paste the Current Value in the text box. Complete the Scheduled Email Report setup process. 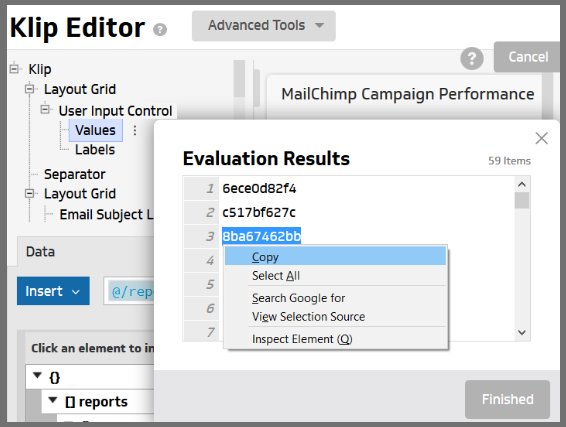 You can now send a Scheduled Email Report of a Klip or Dashboard that contains variables.